"The diet for canine kidney disease plays an important role in the management of kidney failure. Most problems in the kidneys are influenced by dietary intake of calories, phosphorus, sodium, potassium, protein, or polyunsaturated fatty acids. While diet has a positive impact on chronic kidney disease (which progresses over time), the role of diet is still unclear in sudden onset kidney disease (which appears suddenly)." Dietary intake affects the magnitude of the complications of renal disease and is the course of action recommended more than any other. Options are usually individual to a particular dog since appetite and weight loss are the two most common symptoms. An acceptable dietary change for your dog, might be refused by another. There is much debate about the best diet for dogs with kidney disease. Some "experts" say you should feed a low protein diet, while other "experts" say a normal diet is acceptable or even desirable. It's hard to know whom to believe. Both sets of experts have studies to back up their claims. Whatever you decide to do, be sure to seek the advice of a veterinarian. If your dog has acute kidney disease, he's not going to feel much like eating anyway. A low protein, low phosphorus diet will be easy on his kidneys, but if he doesn't like the diet, if you can get him to eat his regular food, that will be better than nothing. He should recover soon and hopefully will have no lasting kidney damage. There is evidence that by making a variety of changes to your dog's diet, you can help your dog with chronic canine kidney disease. Low Phosphorous Diet: Dogs with kidney disease should have low phosphorus diets. Dietary phosphate restriction, when combined with protein restriction, has been shown to slow progression of kidney disease and improve survival. Protein Restriction: A low protein diet is supposed to decrease the work load on the kidneys because they have less protein waste to process. These diets derive more of their energy from fats and carbohydrates, which are supposed to be less taxing on the kidneys. 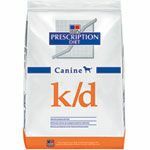 Diet for canine kidney disease such as Hill's Prescription Diet k/d is formulated with lower levels of high quality protein. Higher quality proteins such as meat or eggs reduces the amount of waste that the kidneys need to process. Omega 3 and 6 Fatty Acids: There is evidence that supplements with omega-6 polyunsaturated fatty acids and omega-3 PUFA may offer help for dogs with kidney disease. Safflower oil and corn oil are rich in omega-6 and omega-3 is found in natural salmon oil. Both can be found in a supplement such as Omega 3-6-9. According to research published by Dr. Scott A. Brown from the College of Veterinary medicine dietary supplementation with approximately 0.5-1.0 gm of omega-3 PUFA/100 kcal of diet or 0.5-1.0 ml of safflower oil (omega-6 source)/100 kcal of diet might provide a reasonable starting dose for commercially available preparations. Calcitriol: Calcitriol (active form of vitamin D) is the hormone that helps your dog absorb calcium (calcium metabolism). Studies have shown that providing your dog with calcitriol supplements was effective in reducing renal failure, but did not appear to negatively influence appetite, activity, or quality of life. Natural Supplement: Dietary supplements can be used to help support the entire urinary system. Herbs such as burdock, dandelion and cleaver have properties that provide kidney support and provide a natural source of vitamins such as vitamin D. Pet Alive Kidney Support is formulated for this purpose and is worth further research. Discuss this option with your veterinarian. There is not a clear connection between dietary change and improvement in kidney disease for dogs where the symptoms of kidney disease appear suddenly, however this does not rule out the use of dietary therapy for your dog. If your dog has kidney or bladder stones, the answer is easy. The experts actually agree on this one. There are many types of kidney stones. Most common are struvite stones, which are made of magnesium ammonium phosphate. A special diet is very useful in treating these stones. The S/D diet produced by Hills can actually cause these stones to dissolve. It contains lower than normal amounts of protein, magnesium, and phosphorus. Less protein means less urea, and therefore less ammonium. Remember that struvite stones are made of magnesium ammonium phosphate. Lowering the amounts of these materials makes the formation of stones less likely. This diet also contains more salt than normal, which causes dogs to drink more water, which flushes out the bladder.